Date.com is an online dating website that’s been around since 1997. While sign-up/membership is free, you must upgrade your membership in order to reap many of the site’s benefits. Date.com has a pretty balanced ratio of men to women (55% to 45%). We just have one question: What’s with the lousy name? Could they not have come up with something a little spunkier? The graphics aren’t exactly that inviting either (case and point, look below). 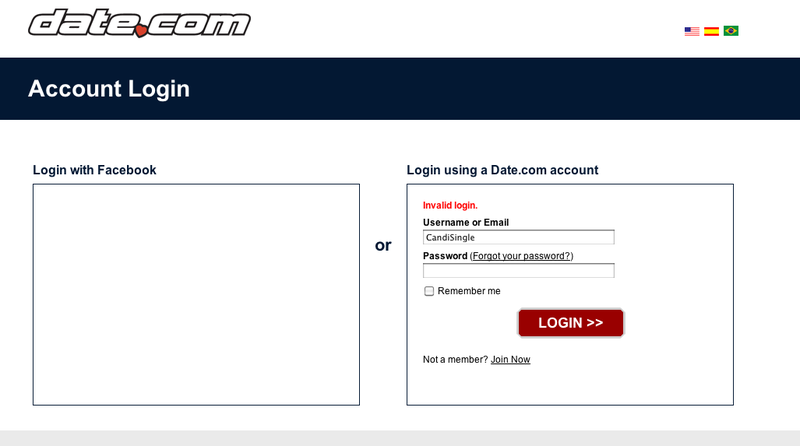 Like many other online dating sites, Date.com lets you see when certain users were last online. This is an important feature because you can track if certain users are dedicated to online dating or not. Before you become a paid member, you can search for locals in your area. This is effective because you can decide if you’re interested in upgrading your membership for geographical reasons. Upon signing up for membership, you’re asked to fill out a detailed questionnaire. I like this in a dating site, because it really narrows down your options when looking for the perfect match. For those who have specific requirements for a future lover, Date.com lets you perform refined searches, so you can locate your match by religion, location, or even body type! Like I mentioned earlier, Date.com is free to sign up, but you must pay if you want to get the best benefits of their site. When I first signed up for Date.com, I thought I was getting myself onto a reliable online dating site. After all, between the website domain and the fact that it started in 1997, I thought I had a good shot at being set up with the right people. Soon after joining the site, I noticed a lot of bots and spammers. Despite the noticeably good ratio of men to women, I didn’t receive very good response from the women I was interested in. When I did receive a response, it was clear that I was speaking to a spammer. This didn’t happen every time, but enough to make me move onto the next dating site. Like many online dating sites, you can’t communicate with people back and forth if you don’t have a paid membership. To me, emailing and instant messaging is one of the most important parts of online dating, so it upset me that I couldn’t access such a basic function without having to pay. When I did pay for the upgraded membership, I found a few flaws. When I chat with people on other social media networks, I’m used to being able to click their profile if I’m communicating with them already (I like to browse a profile while I’m talking to them). Instead of making it easy for me, Date.com actually made me search for their name seperately on the site. Talk about not having easy access! Date.com has been around for a while, and has many features of a basic online dating site. You can create a detailed profile, upload photos, checkout when a member was last online, see who’s viewed your profile, and more. Even with all these features, I found that the people I was interacting with weren’t quality matches. Half the time I didn’t know if they were fake, spammers, or bots. Is date.com a scam?